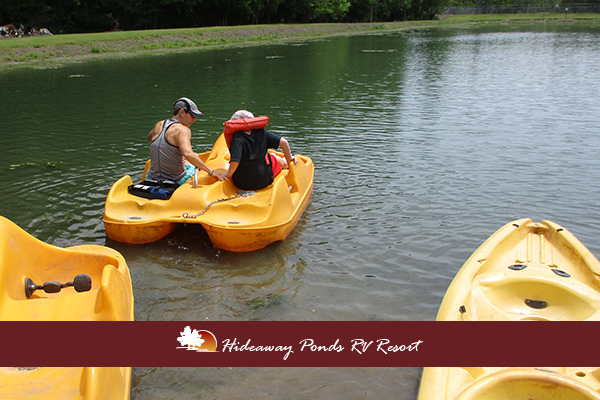 Hideaway Ponds has had a fun year thus far! We have been hard at work building, planting, painting and renovating. As the temperatures continue to cool down, it’s a great time to take a swim in one, or both, of our pools! Members can expect a lot of events going on at the park this fall. In addition to enjoying all the great activities taking place around the park, members are also enjoying the four new cottages that have recently been added, as well as, all the renovations that have taken place on the existing cabins throughout the park. The kids have spent their summer playing on the new playground equipment and riding their bikes along the newly improved roadways. As members enter the park, they are welcomed by our friendly staff at our new welcome center! We started off the summer with an end of school bash. In June, we held a sewing class, to which men, women, and children turned out to learn. The 4th of July was busy, as we had a week-long festivities list to celebrate! Adding to the list of fun, trivia night was a hoot! Several groups turned out to play and it was a Cajun good time! This fall, we will be upgrading our WiFi and adding new picnic tables across the park. We will also be preparing the park for the addition of new sites in the future. In September, we are having our first annual chili cook off, followed by calendars filled with Harvest Fests, campfires and, of course, Halloween. Rounding out the year, we are having our Armed Forces Weekend, followed by our Veteran’s Day Ceremony. Then, later in the month, we will celebrate with more fine Cajun food, celebrating Thanksgiving. Hey Gerald. We have 8 different resorts in 5 different states. Hideaway Ponds is located in Gibson Louisiana. I am interested in the camping sites. Do you have to be a member? And what are the prices? Hi, can I get a membership even if I don’t own a camper ? What is the price of membership and does this include other resorts you have at other locations? Thanks Louise, you do need to own an RV. We love to have happy members come out and enjoy our resorts. There are probably some better options near Hideaway for those who don’t have an RV.